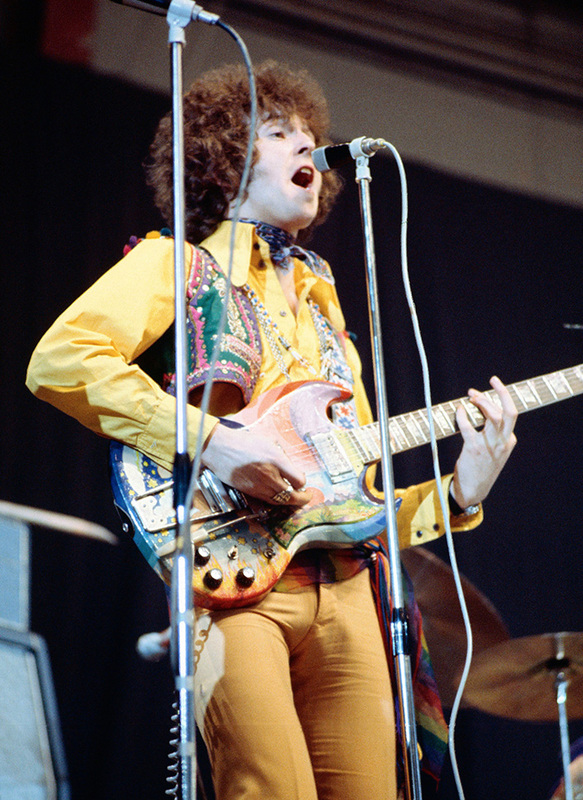 In March 1967, Eric Clapton bought a guitar and quickly decided to give it a fresh look. He'd been through a couple of old-style Les Paul Bursts, both of which had been stolen from him during the last nine months or so. Maybe he was starting to feel that Les Pauls were somehow jinxed? Whatever the reason, he went out and found a used SG. A few days later, he took it to Marijke Koger and Simon Posthuma, two Dutch pop artists working in London. Christopher Hjort's book Strange Brew logs a rare day off for the busy Eric on March 13, and that's probably when he acquired the circa-'64 cherry finish Gibson SG Standard. We know that he used it on March 15, because the sound of the guitar's Vibrola is there on some demos Cream made that day in London. He was pictured with it a couple of days later, still with its original finish, at a gig in Essex. Eric was familiar with the advantages of humbucking pickups and the regular Gibson control layout from those earlier Lesters, but this guitar had a quite different double-cutaway sculpted body. Like many an SG player, he must surely have appreciated the access and range and lightness of the instrument. And he always had an eye for a good-looking item. Eric also had by now a suspicion that older guitars were better than new ones. When a magazine asked for guitar-buying advice, he said: "When you're starting, always buy a secondhand guitar, because it will be 'broken in' and easier to play, apart from the fact that the older the guitar the better it seems to have been made." That summed up neatly the argument in favor of vintage guitars in one prophetic and influential sentence. Soon after the March 17 gig, he went off to see Marijke and Simon. Marijke told me that she and Simon had moved to London in 1966. "We found a great Georgian-style place for rent in St. Stephen's Gardens in Bayswater," she says, "quite run down and dilapidated, but with large rooms. We had two floors, the upper story being the studio with plenty of space to paint and store artwork. This is where we met with the Cream guys for hanging out and photo shoots, as well as with other celebrities later." Marijke and Simon became better known later as The Fool—an art collective and also, briefly, a band—and so Eric's SG is often called "The Fool" SG. 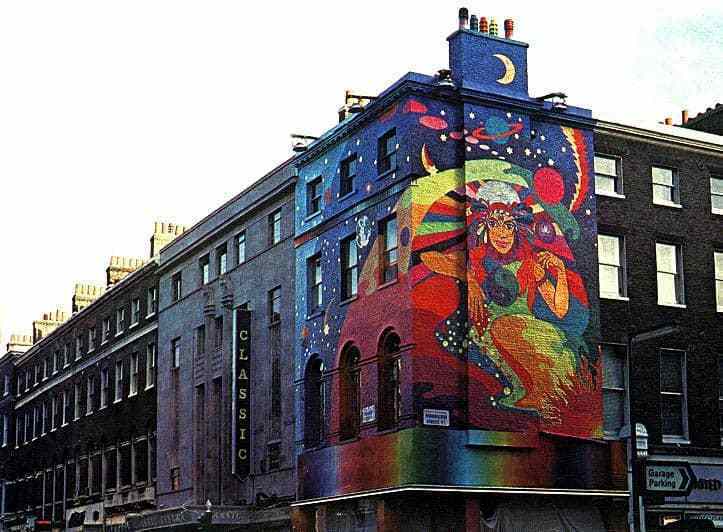 You may have heard of Marijke and Simon for their work with The Beatles, notably the mural they painted later in '67 on the Apple boutique in London (although the shop's neighbors had no taste for psychedelia, and the local council soon had it removed). For now, though, the duo painted Eric's SG along with Jack Bruce's Fender VI and Ginger Baker's bass drum heads. The pair's mural on the side of The Beatles' Apple boutique. Jack disliked the feel of the paint and replaced his Fender with an EB-3, a Gibson SG-shaped bass. Eric was more appreciative. Marijke and Simon's colorful work on the body of his SG featured a playful winged sprite playing a triangle, its curly hair not unlike Eric's look of the time, its toes poised near the controls, and all this set among stars and flames and clouds on a background of blues and purples and greens. The pickguard had a separate scene. A path stretched back to a fat red sun looming over distant mountains, while graduated curves in oranges and browns and yellows followed the body's cutaways, echoed in waves of color on the headstock and the rear of the neck. On the back of the body were more colored waves and an intense set of concentric circles, which ranged from greens through to reds and on to bright yellows at the centre. 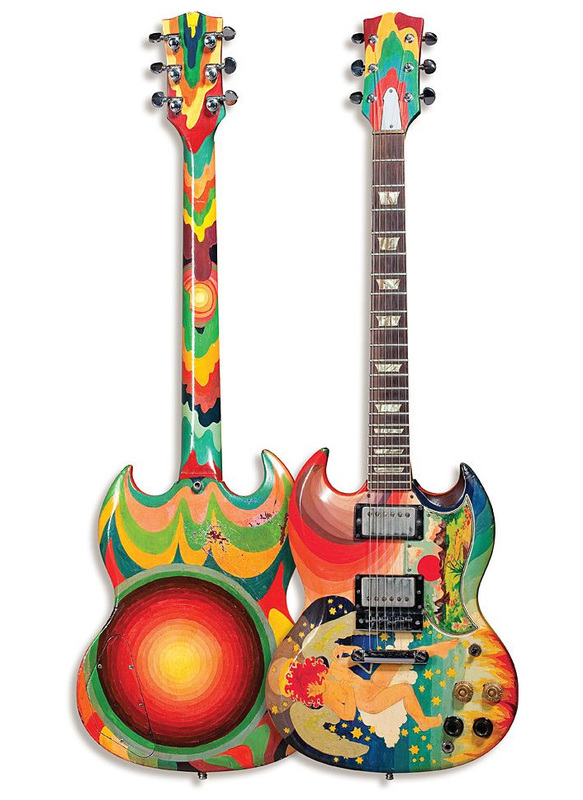 Eric wrote later in his autobiography that the artistic duo had turned his guitar into "a psychedelic fantasy," and it's hard to argue with such a concise description. When he got the SG it had an original Deluxe Vibrola, the type with the long plate and a lyre-and-leaves motif on it, which points to the guitar's manufacture as between 1963 and '65. Almost immediately, he removed the cover plate from the Vibrola, maybe to reveal more of the artwork. Soon he disengaged the Vibrola altogether, at first leaving the arm pointing backwards and out of the way. Later, into '68, Eric had the Vibrola's arm and mechanism removed, leaving the remaining frame as a simple, sturdy tailpiece. He replaced the guitar's original Kluson tuners with robust Grovers, a popular move at the time and one he was familiar with from his Les Pauls. Paint began to flake from the back of the neck, which must have made for an unpleasant handful, and he had at least some of the extra paint there permanently removed. In March '68, the film director Tony Palmer sat Eric down with an interviewer on stage before a show at Winterland in San Francisco to chat about guitar playing. Eric patiently showed how the controls of his psychedelic SG worked. He explained that being a guitarist was a useful way to "play out" frustrations, because you could channel pent-up anger through the guitar by playing aggressively. Clapton shows off the controls and versatility of his SG. "Not the way I use it," he clarified, "but that can be done, too, with people like The Who, Pete Townshend." The interviewer asked for a demonstration. "What," Eric said with a grin, "you want me to break the guitar up?" Apparently not, mercifully—and Eric proceeded to demonstrate musical aggression for the camera. He became fond of The Fool SG. He managed to successfully avoid the guitar thieves, too, playing the decorated instrument as his main stage guitar through the rest of '67 and on into the summer of '68. He recorded with it extensively, too, not least on a lot of Disraeli Gears. Soon, Eric would leave his Gibsons behind, including that wonderful SG and a couple more recent favorites, a Firebird I and a 335. He became a confirmed and, as it turned out, long-term Stratocaster fan. As for the painted SG, at some point he may have given it to George Harrison, but it certainly ended up with Jackie Lomax, a musician friend of George's from the old Liverpool days. Around 1971, Todd Rundgren acquired the guitar from Jackie. Todd replaced the remains of the Vibrola with a stopbar and an incongruous Schaller "harmonica" Tune-o-matic. He also had the body paint restored and sealed, and he had someone replace and re-paint part of the neck and the headstock. Todd occasionally played the ex-Clapton SG until the mid-'90s, nicknaming the guitar Sunny as a nod to Eric's use of it on "Sunshine Of Your Love." Eric put together some of his guitars for an auction in 1999 to benefit his Crossroads charity, and he asked Todd to donate the SG. Todd declined, because of tax complications, but the following year he sold the guitar in an online auction for $120,000 and gave a percentage to Crossroads. The guitar was apparently sold again later for a sum said to be closer to $500,000. Cream - "Sunshine of Your Love," live 1967, with The Fool SG. After he disposed of the original, Todd sometimes played a replica of The Fool SG, as on a series of concerts in 2010 where he re-created his albums Todd, Healing, and A Wizard, A True Star. Eric, meanwhile, kept mostly to his Strats and showed no signs of returning to his psychedelic past. Marijke Koger, one of the artists responsible for the look of the Fool guitar, has explained that the single thread running through all her paintings is nostalgia for paradise, which she says embodies hope for a better world, one with more joy, beauty, and peace. About the author: Tony Bacon writes about musical instruments, musicians, and music. He is a co-founder of Backbeat UK and Jawbone Press. His books include The SG Guitar Book, Fuzz & Feedback, and Guitars: The Illustrated Encyclopedia. Tony lives in Bristol, England. More info at tonybacon.co.uk.